Picnic, BBQ and Outdoor Pest Control – Flies, ants, bees, etc. 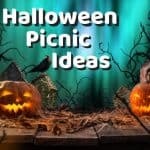 Home » Blog » Picnics » Picnic, BBQ and Outdoor Pest Control – Flies, ants, bees, etc. 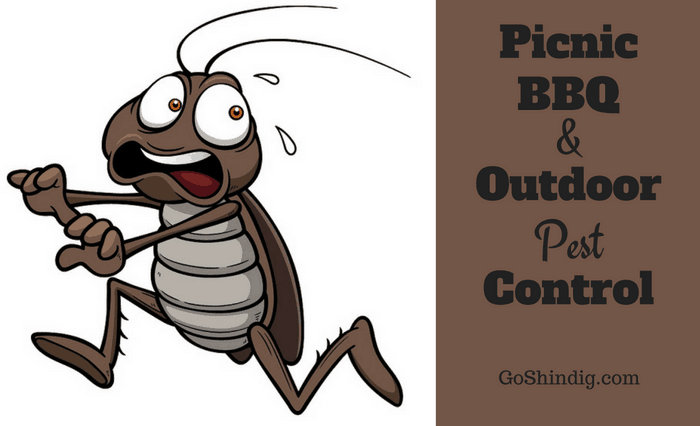 Outdoor pest control is something that crosses all our minds at some point. Some genius that’s clearly working well above my pay grade has come up with this amazing stat – there are 200 million insects to every human. The guy that’s come up with this crazy number must have some unbelievable abacus skills to have done all that counting. But let’s take him at his word. This shows that as much as we think we dominate planet earth, we’re still living on a planet dominated by tiny bugs. And because of this stat, the best we can hope for when entering the great outdoors is simple outdoor pest control. We can’t eliminate them so if we have flies, ants or bees invading our perfect picnic or BBQ we have to look at ways of moving them on by making it uncomfortable to stay. Denying them food, or by offering a decoy food source. But first, there are steps we can take to minimize the chances of bugs becoming an issue in the first place. The most obvious step comes down to picnic planning – choosing the right location. If it’s summertime, do not pick a location near a body of stagnant water. This is the breeding ground for many different insects and with it being summer they’ll want to join your outdoor shindig. Once you arrive at the location of your planned picnic or BBQ all you want to do is unpack and tuck into all the fantastic food and drink you’ve been thinking about the whole way there. But take a minute and survey your surroundings. Look out for simple things such as a bees nest or an ant hill. And if you find one, obviously relocate to another area. If you’re one of the cool kids in the insect world the place to be seen is your local bin. So again, practice good outdoor pest control and set up your picnic or BBQ in an area far away from any refuse point. Have a quick look around and if possible move your eating area out into the open a good hundred meters away from the bugs’ social scene. Insects haven’t joined your outdoor party to listen to your jokes or to sit there continually pressing skip on your playlist, passing comment on how rubbish your taste in music is. No. Outdoor pest control suggests if you do your best to deny them this, they should move on to easier pickings. Keep food packed away until right before it will be served. Bring food covers to protect your snacks when left unattended. And as for the creepy critters favorite picnic and BBQ treats, sugary drinks, do your best to bring resealable containers. If this isn’t possible, a common trick many picnic goers use is to bring cupcake liners with a straw poked through the middle. The cupcake liner then acts as a shield once the straw is placed in a drink. A more expensive option is to use mason jars with a hole in the lid as shown below. Pack a battery powered fan to help with outdoor pest control. Flying insects don’t like the unnatural displacement of air a fan provides. So placing one to circulate air over your food should annoy them sufficiently for them to move on. With the added bonus of keeping your food a little cooler. A company called O2COOL provide a vast array of battery powered fans for outdoor use. And one I can recommend as I use it myself is their 5-inch portable fan . At that price, you can’t go wrong. “Yes your luminous yellow picnic blanket looks lovely, I’m not sure why everyone doesn’t have one.” Maybe it’s because such bright colors attract lots of insects. So when packing your picnic or BBQ, make sure you don’t use brightly colored bags, baskets, seats and of course blankets. If you follow the above steps, you’ve done your best to effectively implement outdoor pest control. But as we know, “the best-laid plans of mice and men often go awry”. So let’s have a look at ways to rid ourselves of the most common bugs that may become a problem. From my experience with picnics and barbecues, people hate flies more than any other insect. Which is surprising as insects such as mosquitoes and bees can give nasty bites and stings. But I guess it’s because flies are seen as filthy bugs. Always attracted to nasty smells and rotten food. The sort of things us humans find disgusting. So needless to say, there are hundreds of methods and tools for getting rid of flies. But which are the best methods for doing this when entertaining outdoors? We have broken up this section on flies into several mini sections, Repellents, decoys, traps, mechanical, electrical and chemical. Your options when it comes to repelling flies is enormous. If you have a quick google you’ll find all sorts of weird and wonderful potions. Here are the best options available for keeping flies away from a picnic or BBQ as that’s all we’re interested in really. 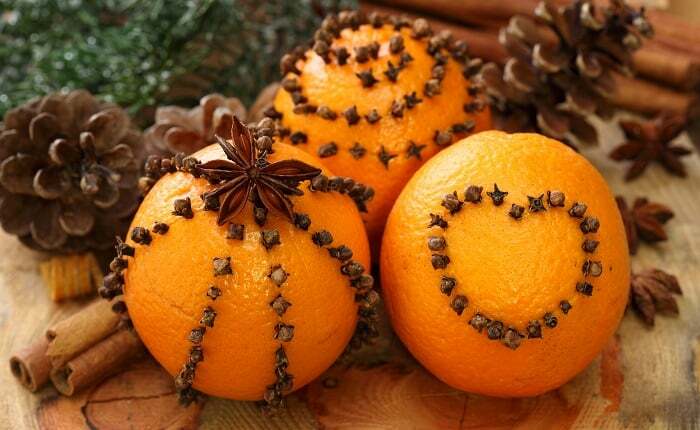 The most commonly used method is to stick cloves in a fruit. Normally it’s a citrus fruit such as a lemon or orange but I have seen people recommend other fruits such as apples or pears. The great thing about this form of repellent is that it can double up as decoration for your picnic blanket or table and of course it is very easy to make yourself. When I use this method I normally play it safe and stick with citrus fruits. Outdoor pest control is sometimes seen in the most random everyday items. Something you’ll find at most outdoor shindigs is vodka, and I was surprised when I found out that flies absolutely hate the smell of vodka. 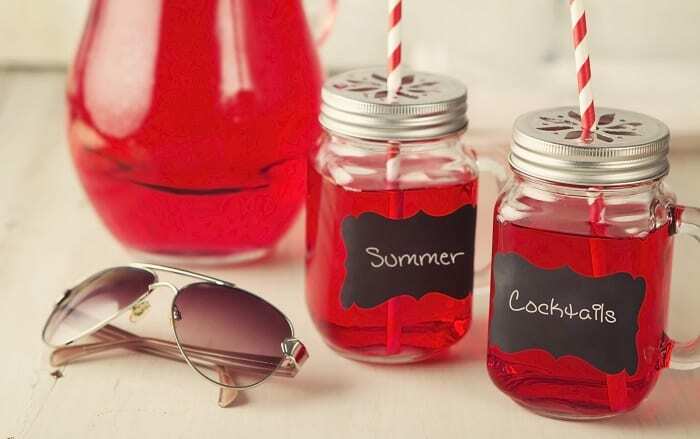 So if ever you needed an excuse to bring an alcoholic drink to a picnic or BBQ here it is. Herbs! There are many herbs that flies can’t stand. Which is good as you might have already used some of them in your food already. Some are commonly used such as Mint, Basil and Lavender so you shouldn’t have a problem getting your hands on some. But you also have herbs such as Elder, Tansy, Wormwood, and Rue. My suggestion would be to do something similar to that of the cloves and make eating area decorations with these herbs. Bunch a few of the herbs together, tie an elastic band around the storks and place around the table. A staple of most outdoor eating events is Citronella candles. Flies hate the smell and will leave pretty quickly. Please see the mosquito section for more information on Citronella candles. I’m in two minds with decoy food for flies. Yes, they will more than likely go to the decoy food instead of your picnic or BBQ food but it will also attract them in the first place. And once a certain number of them turn up a few strays might decide to have a look at what you’re serving up. It’s still a great tool in your arsenal if you’re not expecting many flies. But at certain times of the year when flies are around in large numbers, it might be better to use another form of outdoor pest control. A little bit of rotten meat will work best for this, but of course, virtually any rotten food will have them showing an interest. My tip would be to combine the decoy food with the trap method below. As long as you’re happy with killing the flies. There are many different variations of fly traps, but all follow the same basic structure. Having a large container filled with “fly bait” and a funnel placed on top. Watch the video below for all you need to know. Mechanical methods for killing flies are by far the most fun (as long as your guests don’t object to you killing insects). And there some ingenious contraptions built just for this purpose. For me, the Bug-A-Salt 2.0 is one such tool. I’m not sure if this has been constructed to have fun with or to eradicate flies. Either way, it does both with the added bonus of looking macho cool. 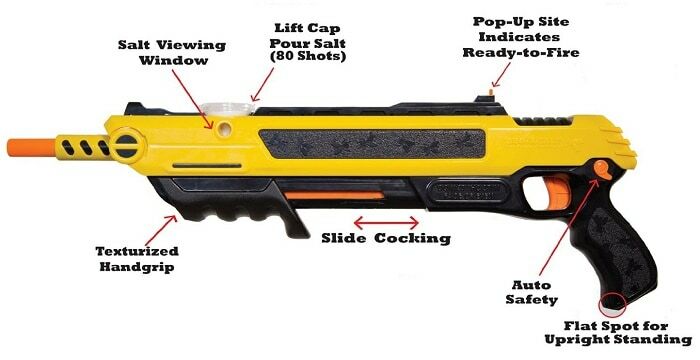 Bug-A-Salt is basically a gun that you fill with salt. You get 80 shots before reload and can kill pretty much any insect from a range of 1-3 foot. There are a plethora of videos of this gun in action over on youtube if you want to see it in action, including one of someone shooting their hand to show how safe it is. But I’d highly recommend not doing this and to be sensible and safe when using. I’m sure for some, the Bug-A-Salt might be a little overkill for outdoor pest control (I’m not one of them, I love the gun). So let’s look at smaller options. The Air Venturi Fly Shooter is one such option. It is in the style of the more traditional fly gun. But as one will be needing to get rid of flies at picnics and BBQs then it is best to buy one that has a string attached to the projectile – you don’t want to be chasing after it after every shot. Fly vacuums are another option if you don’t wish to kill any bugs. You might be thinking a vacuum should be in the electrical methods for outdoor pest control but Bug Zooka has created a battery-free bug vacuum they claim is ten times more powerful than motorized vacuums. I must confess I’ve never used a bug vacuum. For one I’m happy with my Bug-A-Salt and two, the reviews have always been a bit sketchy on them. But if you do wish to try them out then Bug Zooka are the market leaders in this type of bug control (also please tell us what you think of them in our review section). You do have options available that don’t involve you being hooked up to the mains. A couple of solar-powered units that do a reasonable job are from Solarmks and YIER. The electrical options above are ok for a few, but for any picnic or BBQ, my choice of electrical bug killer would be the Elucto Fly Swatter. It’s battery powered, does the job and is portable. The biggest bonus is that you can also now hunt down flies and you don’t have to wait for it to land. Although chemical bug killers are super effective (RAID for example) I have left this section to last. And for good reason. This article isn’t just about killing flies and other bugs outdoors. It’s about pest control while entertaining outdoors. And this generally means food and drink being consumed. And often with pets and small children. These conditions aren’t conducive with having harsh or potentially dangerous chemicals about. So if possible I’d avoid this method. But if chemical pest control is the method you have chosen then let me suggest a slightly less harmful option. Something everyone, except maybe some University students, has in their house is dish soap/liquid. And it might surprise you to know that this can be used as one of the most effective fly sprays. Simply add some to water and pour into an empty spray bottle and you’re ready to go. Why does dish soap make such a good fly spray? It’s all down to the small amounts of borax in the soap. When this is sprayed onto flies it dehydrates their exoskeleton which leads to certain death. Firstly, let’s start by dispelling a popular myth. If you have read a couple other outdoor pest control articles on getting rid of ants at your picnic before coming here, then you will defiantly have read that ants will not cross a chalk line. This has been proven to be incorrect and is believed to be a myth started due to the fact ants wouldn’t cross a line of “Chinese chalk”. This has now been banned due to it being laced with insecticide. View the children’s experiment below to see this in action. And to give you tips on other powders you can use to keep ants out. Ants seem to instinctively know if they climb the legs on your picnic table that they are going to find food. So a great idea to keep ants away if you’re using a picnic table is to place the legs in plastic cups of water (or frisbees if the legs are rather fat). Ants can’t swim and will now drown if they try to scale your picnic table. If you see one lone ant roaming about it is best to kill it. It’s very likely this is a scout ant and you don’t want it making it back to the nest with stories of how beautiful your food is looking. But, of course, you’re more likely to see ants once it’s already too late and the nest has been informed. If this is the case then follow the ant trail back (ants will all follow the same path as they are following scent trails) killing the ants as you go. You can then leave a decoy piece of food on the trail or if you wish, something poisonous. I’d go with the former, as the ants will take the easiest piece of food first. They will not walk past this gift you’ve given them to go find other food. And of course, poison is also a risk to small children and any pets in the area. The one insect where I’d rather try a repellent or a decoy than kill is bees. Why? Basically, bees have been having a pretty tough time of things lately. Numbers are falling due to colony collapse disorder where whole hives are wiped out. And as most of you know, bees are very important in much of the pollination that takes place – and on a selfish note, I love their honey. So what are the options for outdoor pest control when it comes to bees? We have all seen a group of grown adults throwing their arms around wildly while running around like headless chickens. So we know the fear of being stung is the major issue concerning bees. The first thing you can do before going to you outdoor shindig is to select the right clothes. Your choice of clothes isn’t going to deter bees. But certain colors or fabrics are more likely to have bees perceive you as a threat, and therefore more likely to sting. Reds and blacks are the colors to avoid. While also having furry or leather clothing will also cause alarm to bees. If you’ve ever watched a nature program with bees you’re highly likely to have seen either beekeepers or foragers collecting honey from a hive. The standard method is to use smoke. This both scares the bees off and makes them more docile. So a smokey candle will do the trick or even the multiple insect deterrent, the Citronella candle, will aide in scaring off bees (not because of the Citronella oil, but because of the smoke). Other options are to use either commercial bee repellent or to knock-up one of the many home repellents you’ll find people recommending. Honey-B-Gone is one such commercial bee repellent if you want to take no chances. If you want to make your own then peppermint oil, catnip essential oil, and cloves come highly recommended. An outdoor pest control option you have with all insects is the decoy food strategy. You know what the bees are after – your sugary food or a drink of water. So give them this somewhere away from your eating area, sugar water probably works best for this. Place a few cups of the stuff around, and in conjunction with the other deterrents, you’ll enjoy a bee-free picnic. Mosquitoes have a finely tuned sense of smell that allows them to hunt you down from a distance of fifty meters. And although this incredible sense of smell is their greatest weapon, it’s possible to turn the tables on them and make it their Achilles heel. We do this by placing scents nearby that they hate. The first port of call for anyone trying to repel mosquitoes at an outdoor event is Citronella candles. But there is great confusion when it comes to Citronella candles. In fact, I only found this out because I was adamant Citronella candles didn’t work – having used them several times with no significant effect. The mistake most people make is they purchase citronella scented candles. From my experience, these candles have little to no effect on mosquitoes. What you need is candles made with actual citronella oil. Seems like a scam to me selling citronella candles that don’t actually repel mosquitoes (as the scented ones are generally cheaper). But maybe some people like the big ugly yellow candles. Me, however, I want them to do a job. There are a lot better-looking candles if all I want is to set a mood. Here is a citronella oil candle I’d recommend. And for you arts and crafty types, here is a great article on making your own citronella oil candle. Unlike many insects that want to visit your picnic or BBQ, mosquitoes aren’t there to feast on your wonderful array of foods and drink. They are there to feast on you. So it’s generally best to have some sort of repellent on you as a form of outdoor pest control. You can go down the route of a lotion for your skin such as Repel 100 Insect Repellent which is a very effective repellent. Some people complain it’s a bit harsh for their skin. I’d not recommend it for children, and instead just spray on their clothes only. Another option for kids and adults alike is mosquito bracelets and stickers. They are relatively cheap and easy to transport. And if you are the host of the picnic then I’d recommend packing some of these. As you can be sure someone will not have brought their own. Many of the methods already mentioned will already have wasps staying away from your picnic or BBQ. But there is a method of ridding yourself of wasps that works solely on wasps – a dummy wasps nest. This is an awesome form of outdoor pest control. And I’m pretty sure you could make one of these easily yourself. But for those of you that don’t have the time you can buy fake nests ready made. Flies have been covered extensively in this outdoor pest control guide but fruit flies need their own special mention. This is because they act a little differently to other types of fly. The methods of using citrus fruits to deter them aren’t going to work. It will more than likely have the opposite effect. They do like fruit after all. So if it’s just fruit flies you are having a problem with don’t use this method. I’d recommend the decoy strategy. Use a small bit of wine and placing a few cups away from the picnic or BBQ area.